Global warming really seems to be playing games with the weather this year! We had 80 degree F days in January and February followed immediately by hard freezes down to 20 degrees F. We lost tomato and pepper starts in the greenhouse on several occasions. 20 degree weather is not that unusual here in January and February, but the drastic temperature swings this year were unprecedented--very hard on the plants! To make matters worse the rains stopped in February. Usually we can count on some rain through the end of April, but this winter the rainy season was condensed into the months of December and January. 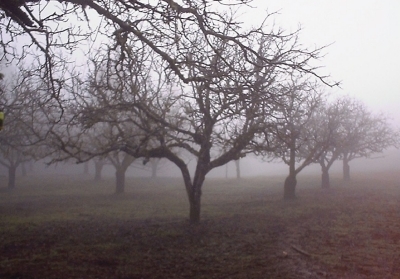 Not very promising for the pastures, gardens, and orchards. 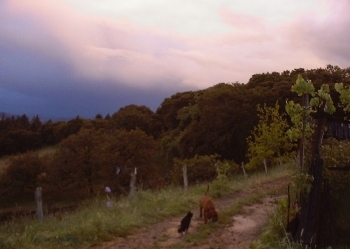 In February we welcomed Jenny Pasewalk to the farm. Jenny will be helping manage the market gardens this year. Like Wendy, Jenny is a graduate of the UC Santa Cruz Agroecology Apprenticeship program so she is already familiar with our French Intensive gardening methods. With Jenny's capable help in the gardens, Wendy hopes to have more time to get the ponies out in public. 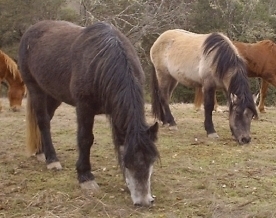 Many people in the U.S. have never seen or heard of Highland ponies! The unusual weather continued throughout the spring, with crazy flip-flops from cold to hot, and no rain. We started having to water the garden in early March--unheard of! With much moving of plastic row covers and remay to protect the crops during the many frosty nights we managed to have a good selection of produce for the opening of the local Farmers Markets in May. We also offered a wider selection of organic vegetable and flower starts than in previous years; 15 varieties of tomatoes, 5 varieties of peppers, 20 varieties of annual and perennial flowers and much more. Our customers were so enthusiastic about our baked goods last year that we decided to offer them on a weekly basis this year. We are renting commercial kitchen facilities from the Boonville General Store on their days off to do our baking. Last year we experimented with a wide range of baked items, but this year we are focusing primarily on our walnut tarts, made with our own hand-shelled organic walnuts. Customers rave about them and come back for more week after week! 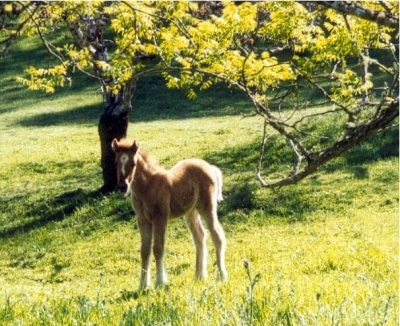 In the pony department, Ladybug produced another lovely foal for us in April; a filly this time. Ronay is a red dun with a white blaze. The cutest little fuzzy baby--she just looks like a little plush toy! Plenty of bone and lots of Highland type from her dad, and a sweet friendly personality. If our summer weather this year was any indication, global warming is continuing to do its thing. of time before running out of water. tomatoes--sounds weird but it is delicious)! 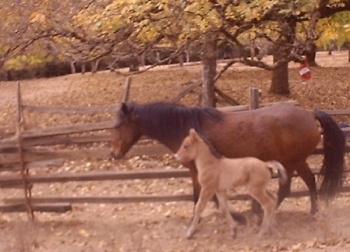 Skye produced an adorable colt in early November. He is named Harris, after the Hebridean island. about everything--keeping his poor mom very busy. Skye will be back to work under saddle soon to continue her training. progress. He's quite comfortable longeing in saddle and bridle or harness, is ground driving nicely, and has started dragging some lightweight poles in harness. He takes all these new things in stride and is a pleasure to work with. He'll be ready to start pulling a cart soon, and I'm really looking forward to that! 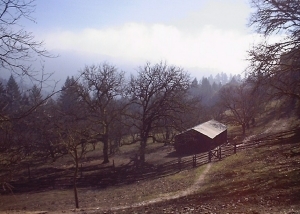 The walnut crop was fairly good this fall, in spite of a very dry year. The unusually warm fall weather kept the tomatoes ripening in the garden through mid-December. We have finally had a killing frost at this point, but are still enjoying the last of the tomatoes which are ripening in the kitchen. Some of the fall planted winter vegetables are already sizing up--we've been eating lots of carrots, kale, and cauliflower. We're saving the last of the apples and pumpkins for pies at Christmas. This year has certainly sped by, an even busier one than ever. We did not to take on any Farmers Market apprentices this year, and cut back from 3 to 2 markets. I also decided not to continue with the commercial kitchen products (jams and baked goods) in order to have more time for other aspects of the farm. Nursery plants have been our main feature at the Markets this season rather than produce. Quartz attended 2 dressage clinics this summer and attracted plenty of attention. "Wow, what kind of horse is that?!" is the question we get wherever he goes. Skye and Raasay both went to wonderful new homes. Skye was sold in foal to Quartz for 2004 and we have retained ownership of the foal. 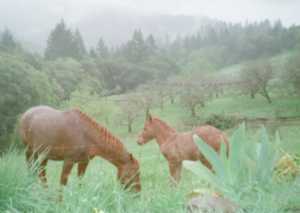 We did not have any foals in 2003 as we instead added 2 purebred Highland mares to our herd. In June we made the 2300 mile round trip to bring home Circle H Shuna and Circle H Highland Mist from B.C. Canada. By far our longest horse hauling trip yet, and with the high price of gas, going to get the mares ourselves was almost as expensive as having them transported by a commercial hauler! 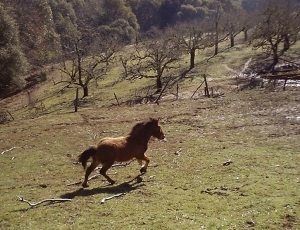 Shuna, the 3 year old mare, was bred to Quartz in early August. She was lightly started under saddle in the fall and is very quiet and kind natured. We are expecting great things from this foal! © 2000-2005 All rights reserved.